Growing up in a suburb of Chicago, museums were around me all of the time. The museums in the city are beautiful and large, being able to meet everyone’s interests. One of my favorite museums is called Graue Mill. It is not in the busy city, but in the suburbs where I live. I love this museum because it is small and personal, having more volunteers than visitors. Graue Mill is located in Oak Brook, Illinois. The founder of this mill was Frederick Graue who was born in Germany but came to the United States to open a mill. The mill took five years to build. The bricks and clay came from the Graue farm. During the nineteenth century, the mill was the center of economic life. Being located on the Salt Creek, the mill had a large waterwheel grist mill that would grind the locally grown wheat and corn. Graue Mill not only made a living for the Graue family for generations, the mill was also used as a route for the Underground Railroad. The mill was one of three stops for the Underground Railroad in Illinois. This station allowed the slaves to hide out in the basement of the mill. Mr. Graue built tunnels that linked the basement of the mill to other hiding places for the African Americans seeking freedom. Every month Graue Mill holds different events. My aunt and uncle volunteered there and they would reenact different events that happened throughout the time the mill was still being used. My aunt and uncle would dress up and do different tasks around the mill. My uncle was a skilled blacksmith, showing the visitors how to shape the metal. My aunt was placed upstairs in the mill, weaving and spinning cotton into yarn. I feel that reenacting and having living history presentations is important for the visitors to see how the mill was used between 1850 and 1890. As learned in class, preservation of old buildings is important for the future, teaching everyone about the past. 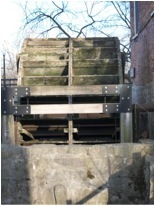 We are now able to learn about the mill and physically see the mill because preservation has taken place over the years. 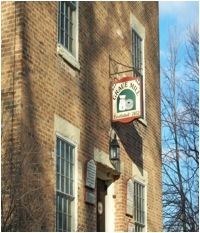 Since 1975, the mill has been registered on the National Register of Historical Places.